Three years after the earthquake struck Nepal, many schools in Dolakha district are still lying neglected. Donor countries that pledged their support for reconstruction have failed to deliver their promises where Indian authorities had proposed to reconstruct 10-quake damaged schools, and the Chinese authorities pledged to reconstruct three schools. 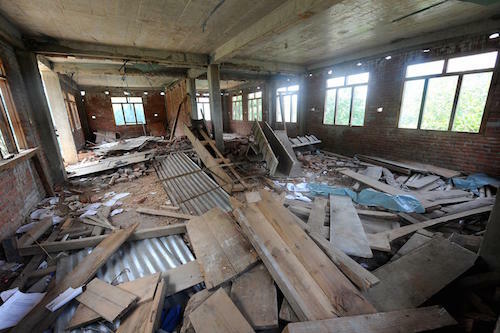 Around 366 schools were destroyed in the 2015 Nepal earthquake, following which the Nepal Government and donor countries decided to revive these important institutions. However, even three years after the disaster both neighboring countries, India and China have not gone beyond pledging support and building the design, respectively. According to the District Project Implementation Unit Chief Dev Kumar Baral, out of the total number of damaged schools, 13 schools are still running classes in temporary fixtures in the absence of donor support. The Nepal government so far reconstructed 71 schools in the district. Likewise, the Asian Development Bank, JICA supported the reconstruction of 109 schools, among other donor agencies. Meanwhile in Makwanpur, reconstruction works are being done for classrooms that were destroyed in the devastating earthquake. According to the National Reconstruction Authority’s (NRA) District Project Implementation unit in Makwanpur, more than NPR 2 billion has been spent to reconstruct school buildings. NRA Project Implementation Unit Chief Prem KC said that a total of 1,274 classrooms are close to completion. Close to 1,900 classrooms were destroyed in the large-scale natural calamity. Speaking at a press meet in Hetauda on January 03, 2019, an NRA official informed that more than NPR 7 billion has been spent on the reconstruction of school buildings, private homes and other infrastructure in Makwanpur districts.